There are so many details to these projects, so I will be brief. If you need more details, please email me. 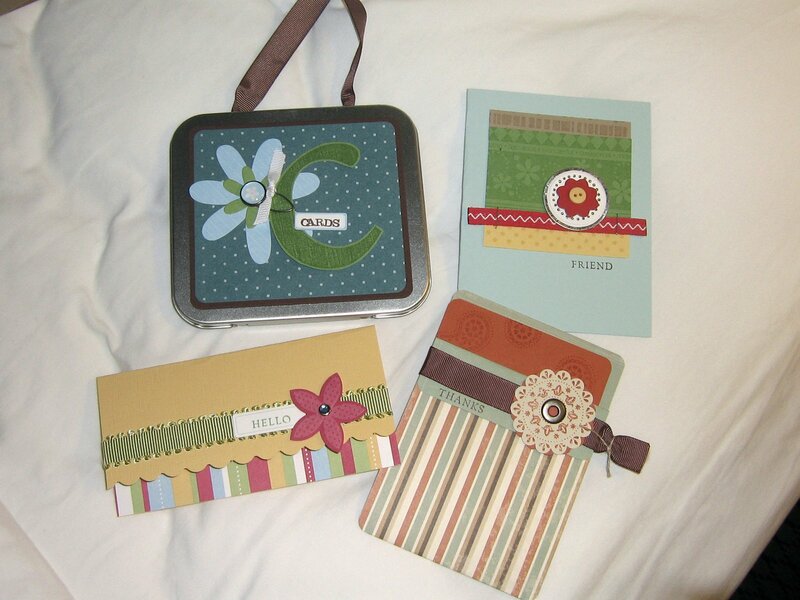 The 1st project is a card tin purse made from the build a flower kit and the build a brad kit. The next is a Friend card made from the Happiness backround stamp and some chipboard. Next is a 6×3 card using the corner rounder for the scallop and some Cutie Pie designer paper and the build a flower kit. The 4th is a pocket card using the Wanted stamp set, matching paper, scallop punch and the crop-a-dile for dry embossing, eyelet setting and punching! I love that thing now that I know how to use it! I’ll be back home tomorrow with more projects to show! Wow! !I love these cards! Especially the color combos. Who knows maybe I will be joining you next year!